Every four years, the world gathers for the summer Olympic Games. If you live in a temperate country, the Olympic Games occur every two years because there are the Olympic Winter Games in the interim. On February 7, 2014, the XXIInd Olympic Winter Games begin in the Black Sea resort of Sochi, Russia. 1. When did the Philippine flag first appear at the Olympic Winter Games? This is a strange one because the old sod is a tropical country and wasn't expected to have any sort of winter sports participation. Nonetheless, the Philippine flag made its first winter Olympic Games appearance at the XIth Winter Games at Sapporo in 1972. It was the first Winter Games held in Asia, and Juan Cipriano and Ben Nanasca became the first Filipino winter Olympic athletes in history. Of course, they were Filipino-Americans with downhill skiing experience from the US. Nanasca finished No. 42 in the Giant Slalom; Cipriano was a DNF (Did Not Finish). In the men's slalom, both were DNFs. Fil-Am participation had better luck with figure skaters in later Winter Olympics. In 1980 pairs figure skater Tai Babilonia was half of the star-crossed pair that was the U. S.' best bet for a gold medal at Lake Placid. 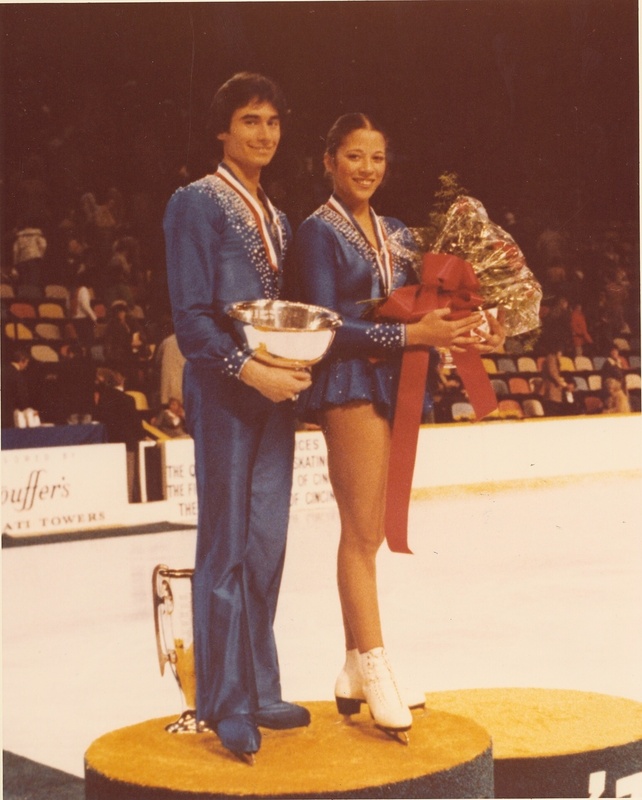 Because they were world champions in 1979, Tai and partner Randy Gardner were the odds-on favorites to dethrone the Russians in pairs figure skating. However, Gardner had a groin injury, and the pair withdrew from the competition at the last minute. Tai is Filipino on her father's side, and African/Native American on her mother's side. 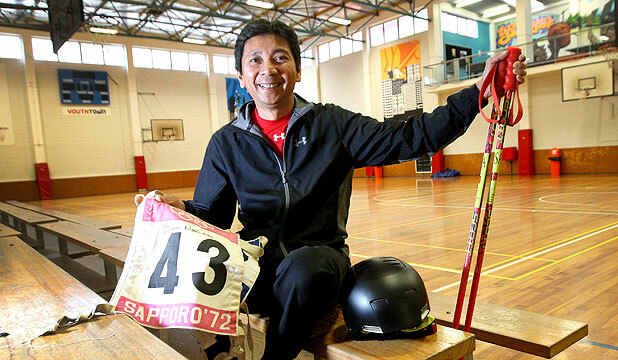 Calgary 1988 - At the Calgary Games in Canada, Raymond Ocampo, Jr., showed the Philippine flag (even though he is/was a Fil-Am) and participated as a one-man luge team. Ocampo is president and CEO of Samurai Surfer, LLC, a San Francisco Bay Area company, today. Lillehammer 1994 and Nagano 1998 - It was similarly a mixed bag for Elizabeth Punsalan, an ice dancer from Syracuse, New York in 1994. (Ice Dance is a distinct discipline from Pairs wherein lifts and more daring maneuvers are allowed, whereas choreographic interpretation is the emphasis in Ice Dance.) Punsalan was the lead female dancer from the U. S. to compete at the Lillehammer 1994 Winter Games in Norway, with her partner and future husband Jerod Swallow. Like Babilonia, Punsalan is Filipino on her father's side. However, personal tragedy also touched Punsalan in 1994. A few days before competing in Lillehammer, her younger brother, a mentally disturbed patient, stabbed their father to death at home in Ohio. Four years later, Punsalan-Swallow competed at their last Olympic Games in Nagano 1998, placing seventh. At the Vancouver 2010 Winter Games, J.R. (John Robert) Celski, was starting to emerge from the shadow of the more famous US short-track speedskater Apolo Anton Ohno. Celski is a Polish-Filipino-American (his dad's ancestry, his mother's, and then his nationality) short-track speedskater originally from Federal Way, Washington state. Celski earned two bronze medals in Vancouver. Although he has suffered a series of mishaps since then, Celski appears to be healthy enough to compete in Sochi and is the US men's best hope for repeat medals. J.R. will be one of seven subjects in a one-hour special to be aired by NBC on February 5, 2014, called "How to Raise an Olympian." Celski is also a documentary filmmaker when he is off the ice. Sochi 2014 will see figure skater Michael Christian Martinez, 17, of Muntinglupa/Manila as the sole Philippine entry in the Winter Games. Martinez is the first true (i. e., not a Fil-Am) Manila-born, resident and trained Filipino winter athlete. Although he earned his blades at the commercial ShoeMart ice rink in Manila, Martinez still comes to the U. S. to train with veteran coach Frank Carroll and 1998 Olympic gold medalist Ilya Kulik. Martinez has already won some 194 medals. ShoeMart Skating Union and PFSA (Philippine Figure Skating Association) pay for some of his training and expenses. Being the lone Filipino male figure skater at these Games puts Martinez and the Philippines on a par with host nation Russia, a traditional powerhouse in figure skating. Due to strange qualification procedures, Russia will only have one male figure skating spot at the competition this year. As NBC will be showing all the figure skating competitions on NBCSN (a cable channel, NBC Sports Network), one can catch Martinez compete on February 13 for the Short program; if he makes the top 15, compete again the following day on February 14 for the Long or Free program. Making that cut alone would be a landmark achievement for an ice skater from a tropical country. Unfortunately, the rest of the ceremonial secrets are not so Filipino-centric anymore. 2. How far in advance are Olympic ceremonies conceived and planned? Olympic host cities are picked seven years in advance (i. e., Tokyo 2020 was just selected in September 2013). Normally, the host cities start planning the ceremonies (picking the key creative people, conceiving the script, designing costumes, etc.) two to three years before the actual Games. Since the ceremonies have become more complex and a greatly anticipated global event, the core creative team is chosen some four to five years prior. 3. Singers sometimes lip-synch at Olympic ceremonies. This is mainly because of sound balance and considerations for ambient microphone noise interference. Prerecording the performance also preempts forgotten lyrics, a frog in the throat or just plain nerves striking beforehand. Also, sports stadiums have terrible acoustics, so using pre-recorded performances helps deliver a cleaner, better balanced product for the live audience. Even the orchestras sometimes play-synch, especially in the Winter ceremonies when the low outdoor temperatures change the sound of the instruments. Finally, if the performer is feeling slightly under the weather, his/her performance, already pre-recorded, ensures that the show will still go on at its highest level. Even the late tenor Luciano Pavarotti was pre-recorded and lip-synched at the Torino 2006 Winter Games opening ceremony. Pavarotti was already quite ill at the time and the event marked his final public appearance. 4. The originally slated performers at the Los Angeles 1984 Closing and Atlanta 1996 Opening ceremonies were Michael Jackson and Ray Charles. For the closing ceremony in LA in 1984, Michael Jackson was the original choice to perform. However, when it was learned that he had done commercials for Pepsi-Cola, Lionel Richie replaced him. Coca-Cola is the longest continuing global sponsor of the Olympic Games (since 1928), thus it carries a lot of clout within the corporate Olympic world. Also, Richie was not aligned with any soda sponsor. Similarly, at the 1996 Centennial Games in Atlanta, Ray Charles, an Atlanta native, should have been the ideal choice to sing Georgia on My Mind, the official song of the host state of Georgia, at the opening ceremony. However, Charles was also a Pepsi spokesperson at the time so again, that precluded Charles from performing his signature song at the official ceremonies. Instead, Gladys Knight, also an Atlanta native, was picked to sing the classic song at the opening. 5. What are the best seats in the house? The most expensive tickets, the Category A seats, are NOT the best seats to buy for an Olympic ceremony. The cheaper, higher seats (Category C or D seats) offer the best views to see and fully appreciate the often-intricate choreographic patterns that are created for these shows. You don't get the same view from the lower seats for which you're paying a premium. For example, see the full scope of the stage of the Opening of the 2010 Winter Games in Vancouver (below). The Category C and D seats are also the most affordable to buy. If you happen to be a student or an indigent living in an Olympic host city, you would also be eligible to purchase especially priced, cheaper seats not given to foreign ticket allocations. Those tickets are good as gold. Finally, if you are truly desperate and can get yourself to the Olympic city a few days before opening, many tickets are oftentimes available for the final dress rehearsals at a fraction of the actual opening ceremony night prices and for which they need to fill an Olympic stadium (next secret). 6. Why do they need a full audience at the final dress rehearsal? For Plan B. Except for the Parade of the Nations, the speeches and the Lighting of the Cauldron, all the other artistic parts of the opening ceremony are taped at the final dress rehearsal as if it were the actual opening night. The tape serves as the Plan B “stand-by, backup” copy. In the event of a power failure during the actual opening night (as happened at the 2013 Super Bowl telecast), there will be a backup copy to fall back on. A full audience on the tape-copy would match the situation of full stands on actual opening night — thus making any transition to a backup tape appear seamless to the home viewer — until the power situation is restored and “live” broadcasting resumes. It's just showbiz. 7. What happens when the Olympic Flame goes out? Per IOC (the International Olympic Committee, the organization owning and vested with running the Games) protocol, the sacred flame must never go out. It is first lit at Olympia, Greece by the rays of the sun. The flame is then carried by a relay of thousands of runners on its way to the Olympic host city. Once it arrives at Olympic stadium, it must burn uninterrupted for the 17 days of the Games. However, other circumstances have dictated otherwise. At the 1976 Summer Games in Montreal, rain fell on the main cauldron at Olympic stadium and put out the flame. A worker nearby saw this and relit it using his Bic lighter. When the organizing committee learned of this quick fix, they had that flame extinguished; they relit the cauldron with the mother flame from a miner’s lamp even though that flame was originally and digitally lit via satellite from Europe. But all was well in Olympic town again. In the on-going torch relay for Sochi 2014, a new Olympic record of sorts was established just within the first week of the flame touching down on Russian soil from Greece. The flame died on the second runner (photo below) and 15 more times after that — within the first five days of the relay. By the end of the eighth week of the flame touring Russian soil, The Moscow Times had tallied that the flame had gone out 44 times, not including the trip up to the International Space Station. There is no oxygen in outer space, so no flame burned on the torch. Which then begs the question: Does a “flameless space walk” count as a legitimate part of a traditional torch Relay? More near fatalities. By the eighth week, a runner's jacket caught fire in Abakan, a Siberian city. After 72 days, a 73-year-old wrestling coach suffered a fatal heart attack minutes after completing his 150-meter walk in Kurgan. Finally, one whole torch went up in flames and almost exploded. Despite all this, it is hoped that the flame arrives at the Olympic Stadium in Sochi burning brightly and safely for the opening ceremony on February 7, 2014. 8. An Opening Ceremony inadvertently “covered up” the theft of a famous painting? During the opening ceremony of the Lillehammer 1994 Winter Games, when all of Norway was glued to the magical ceremony unfolding on TV from the small northern town, thieves brazenly broke into the National Museum at the Norwegian capital of Oslo. Since everyone else was distracted by the Olympic show, the thieves carted off a national treasure, "The Scream" by Edvard Munch, from the lightly-guarded museum. Thus, the Olympic event in a way provided cover for the execution of a major art heist. The iconic painting was eventually recovered undamaged a few months later in May 1994, and only Norway’s pride seemed to have been bruised. Lesson? Perhaps producers should not stage such magical and enchanting ceremonies like Lillehammer's opening so as not to unwittingly encourage the misdeeds of malfeasants. 9. Ermmm … that anthem doesn't sound right? Part of the massive preparations for hosting an Olympic Games includes having the correct versions of the national anthems of all the participating nations—204 in the summer edition; and around 85 for the winter. The (recorded) anthems are used at the awards and welcome ceremonies for each national delegation as they arrive at Olympic Village. There have been a number of known incidents where the incorrect versions of supposed national anthems were played with terribly awkward results. Perhaps the most embarrassing documented incident of all time happened in — OK, not at an Olympics but in Kuwait in March 2012 — just to illustrate the point. After the gold medal was awarded to Maria Dmitriyenko of Kazakhstan for winning the 75-trap shooting event, the P. A. system blared out what sounded like the right “My Kazakhstan” except on closer listening, the lyrics sang of "… potassium deposits, dirty swimming pools, prostitutes …" and other pejoratives. Dmitriyenko tried to keep a straight face in what was supposed to be her moment of glory, but the organizers had unwittingly picked the parody version of the anthem from the spoof film, “Borat” by actor Sacha Baron Cohen. Yikes! At that same competition, the host Kuwaitis also got Serbia's anthem wrong. The so-called Protocol unit had lazily taken both anthems from the Internet instead of from the embassies. Afterwards, the Kuwaitis apologized for the faux pas and restaged at least the ceremony with the correct Kazakh anthem the second time. And this is why it is crucial to have an updated protocol expert in charge of this phase of the operation. Luckily, it has not happened to the Philippine national anthem yet, but other equally startling documented protocol faux pas, including Olympic ones, are detailed in my book. 10. How are Olympic Stadiums transformed from opening ceremony stage to athletic competition mode? Sometimes very quickly. A year before the Games begin, a hectare of land is leased and filled with 4'x 4' plastic trays holding especially prepared sod. Over 6,000 of these plastic palettes are filled with the right soil and planted with the Bermuda/Kentucky blue grass hybrid, the hardiest, sturdiest strain of grass known. The plastic palettes are high-tech trays designed for optimum drainage and aeration; embedded with special sensors which monitor the soil temperature 24/7; and can easily be lifted for transport. Once opening ceremony is over at Olympic Stadium, the infield is then cleared and made ready for the new layer of turf to be laid, like a giant jigsaw puzzle, in two-to-three days' time. 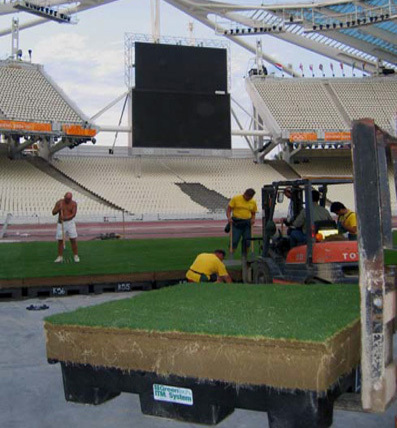 For Athens 2004 (photo above), it took 62 hours to lay the new turf. At Beijing 2008, it only took 30 hours to get the same job done because the Chinese organizers employed an "equal opportunity" policy — the PRC Army laid down one half of the field while the Chinese Navy put down the other half. In London 2012 it took about 48 hours to achieve the same magic of transforming the infield from a show stage to a turfed one ready for the athletics competition. Myles A. Garcia's book, "Secrets of the Olympic Ceremonies", is available in the deluxe paperback edition or on Kindle from Amazon.com as well as various eBook sources. (Note: the paperback edition contains over 160 photographs vs. only 15 in the eBook version.) If funds are limited, you can also request your local library to purchase a print copy. Sometime in February 2014, author Garcia will be seen in a documentary about the London 2012 Olympic flame, called “The Flame” (http://www.watchtheflame.com/). For autographed copies of the book, place your order via the book's website: www.secretolympiceremony.com or Garcia's personal email at: razor323@gmail.com.